It might be the thrill of starting over or maybe the sheer anticipation that comes from the unknown. Either way, I absolutely love the newness that comes with the New Year. I also love making plans and setting goals. What I don’t like is making New Year’s resolutions. Like so many others, I have tried and failed at New Year’s resolutions. My attempts at setting resolutions, have become, well…uh…discouraging. Thankfully, I have found a set of practices that really propel my year and set me up for success. I’m sharing these with you in the event that they might help you too, because feeling defeated at the start of a new year is no way to start. There is a better way! Here are three things that I will be doing to plan and prepare for a fulfilling and successful 2016. Rather than create a long list of things I want to do for the year or promises that I can’t keep, this is what I do instead. I choose one word that will sum up what I want to focus on, who I want to be or how I want to live. I highly recommend committing this process to prayer. Ask God where he is leading you and what he wishes to show you. Your one word may not come to you when you expect it but it will come. Think about what God has been putting on your heart again and again. Pray, pay attention and listen. 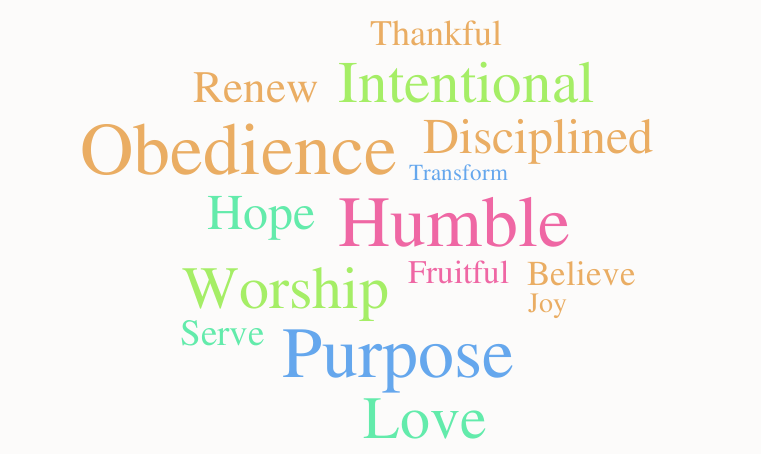 For inspiration in finding your one word, see the word cloud below or visit the One Word 365 home page. Here at One Word 365 you can connect with others who share your one word in order to receive encouragement and support. Once I have my one word, I then set out to make my one word come alive by creating a vision board. Choosing a theme scripture to go along with your one word could be your springboard for creativity. To create my vision board, I focus on my roles and my relationships and I try to imagine what I’d like to see in these areas of my life in the upcoming year. I pay special attention to my relationship with God, my husband, my children, my family and friends, and those who don’t yet know Jesus. Last year I chose the word FULL as my one word. My theme scripture became John 10:10 which reminds me that Jesus came (and died) in order that I might have life to the full. 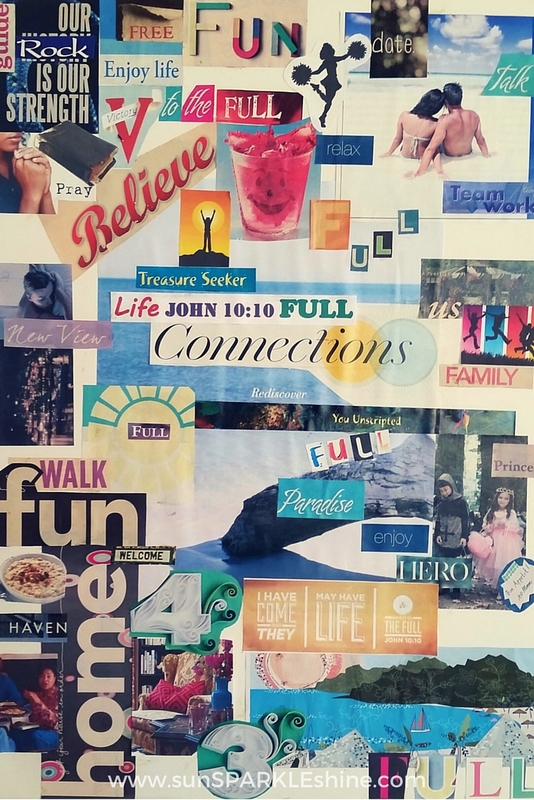 My vision board is a powerful reminder of the FULL life that God wants me to have, with the word FULL appearing over and over again. Can you count how many times you see it? This is a brand new resource that I will be adding to my New Year routine this year. Grace Goals is a revolutionary way to approach change. Using the downloadable book and goal setting worksheets, I will create my personal plan for the year. I love that it focuses on God’s grace to help me accomplish the things he’s put on my heart. No more self-reliance and will power. Instead I have God’s power as my source of inspiration, motivation and strength. You can find out more about Grace Goals using this link. If you choose to purchase it using my link, let me know and I will send you a Year End Review — a 3-page guide which helps you see where you’ve been in 2015, what you’ve learned, as well as determine where you want to go and how to get there. So there, you have it. Three strategies to kick off your New Year with an amazing start! How do you approach the New Year? Resolutions? Choosing one word? Goals? Did you catch how many times my one word appeared on my vision board? What will your one word be for 2016?